Silk textiles decorated with large human figures are one of the most striking products of Iranian weavers in the 16th and 17th centuries. This length of velvet was probably used as a hanging. It shows aristocratic young men standing in a flower-strewn garden, on either side of a cypress tree that grows by a fish pond. Silk velvet with repeating composition of two young men flanking cypress trees by ponds, the field semé with flowering stems. Foundation weave: 5 end satin, decochement 3 by 1 and 2 wefts. Warp: 2 warps: 1 foundation warp, 1 pile warp. Proportion: 6 foundation warps to 1 pile warp. Material: silk, Z twist, yellow. Velvet Warp: Silk. Not possible to determine the twist. The colours are: gold/yellow, green, blue, red, white, black, and apricot. It is assumed that the black pile warp predominates and the other colours introduced when needed in channels. According to an analysis of an identical piece by Reath, this velvet employs the pile warp substitution method for introducing colour (Reath, 1937). Proportion: Not possible to determine. Supplementary wefts: Not possible to determine but would expect to see a supporting weft on the back as the velvet warps are not visible on the obverse under the satin foundation. Material: silk core, yellow and white, S twist. Metal threads wrapped around silk core in S direction. Thread count: not possible as the reverse was not accessible. Description: Cut, voided velvet. Two men holding a flower to their nose, either side of a cypress tree. Each row of men alternates. 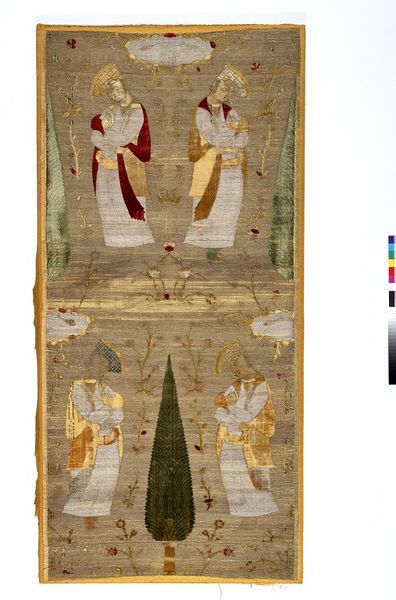 As this fabric demonstrates, the Safavids were unfazed by the traditional Islamic wariness about figural imagery; indeed, they positively gloried in such imagery, creating magnificent garments full of pictures of beautiful youths, scenes from Persian literature, and so on. Such garments were of particular value on diplomatic missions, where they served to scandalize the Safavids' much more traditionally-minded Ottoman rivals. 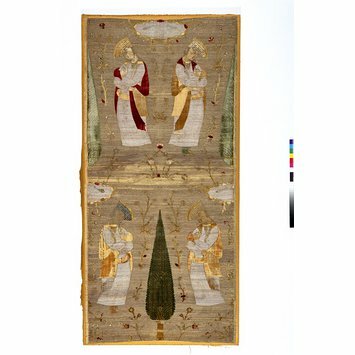 Silk velvet with young men flanking cypress trees, Iran, late sixteenth to early seventeenth century. Illustrated in 'Iranian Textiles' by Jennifer Wearden and Patricia L Baker, V&A Publishing, 2010, fig.2 page 12. Young men smelling flowers, among cypress trees, flowering plants and fishponds. In silk pile and silver, on a gold ground, this is a masterpiece of velvet-weaving.